This heavyweight thermal embodies the chill of weather. 100% USA cotton, 18 singles. 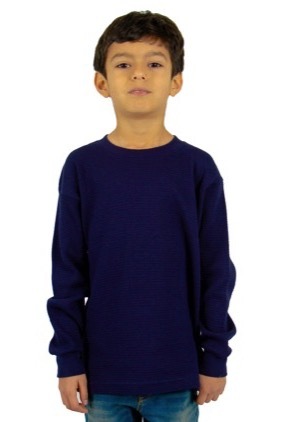 5.8 ounce heavyweight thermal youth long sleeve. Shoulder to shoulder neck tape. 1” double stitched bottom hem. Heavyweight waffle knit. 1” neck ribbing. Ribbed wrists cuffs. Forward thrusted shoulder seam for comfortable neck fit. Woven neck and side seam labels.